Three dockworkers were injured during dismantling a pipeline from cruise ship Costa neoRiviera at Dock 6 in Palumbo Ship Repair Yard in Cospicua, Malta. The workers were dismantling a pipeline on the at docked vessel, when the escaping steam burned them. Two of them were hospitalized with severe injuries, while another one was slightly hurt. The accident were reported to local authorities and was started immediate prosecution and investigation for the root cause of the accident. There is no danger for the life of the injured people, but work at the dock was suspended until inspection for following the safety rules. “The men were dismantling a pipeline on the Costa neoRiviera at Dock 6 in Cospicua when a line in the ship’s control room was accidentally opened”, said the shipyard spokesman in statement. “We are still monitoring the situation and trying to establish exactly what happened”, added he. The cruise ship Costa neoRiviera (IMO: 9172777) has overall length of 216.00 m, moulded beam of 28.80 m and maximum draft of 5.00 m. The ship has 8 decks and capacity for 1,700 passengers. The deadweight of the cruise ship is 4,225 DWT and the gross tonnage is 48,200 GRT. 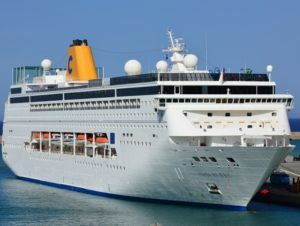 Since 2013, Costa Crociere invested 10 million euros into refurbishing Costa neoRiviera and into maintenance checkup of Costa neoClassica and Costa Voyager.